This morning I received an email alert about a spammy comment left on this site that began by saying “I see you need some fresh posts.” Touché, spam. If you’re ever left feeling a similar need for some fresh Milkweed, please join me on Instagram, where I update far more frequently (and where there is a whole community of Montessori-minded parents). Speaking of fresh, about 24 hours ago we rolled in from our old-fashioned family road trip, during which we camped our way to the East Coast of Canada and back. The trip was full of natural beauty, family giggles, noisy singalongs and highway-side potty stops. Some sweet memories were made, and some great lessons were learned along the way. If you’re heading out on a summer road trip before the season ends, here’s a bit of what we gleaned on the open road. Going off road. 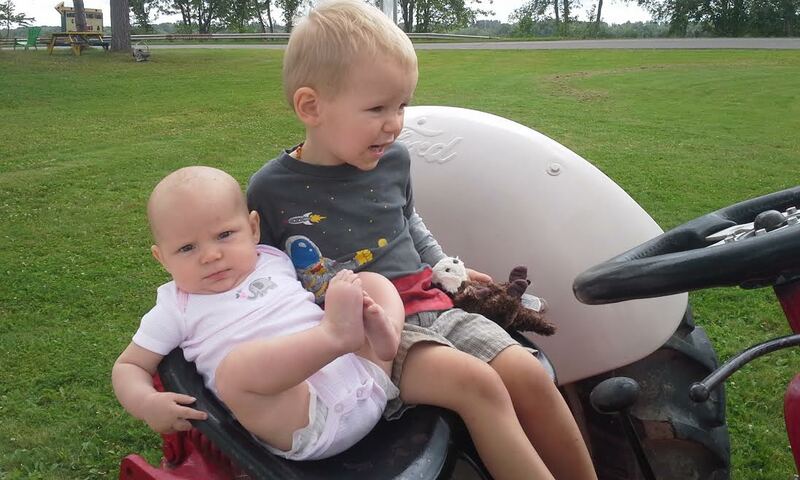 At four months and nearly three years old, our kids were amazing passengers (so perhaps tip #1 is “get lucky”?). We tried to drive as comfortably as possible — with snacks on hand, with full bellies, with frequent washroom stops, and for some of us, with a stuffed baby otter in hand. Whatever works. We had a policy of stopping any time the kids needed to, and it turned out they didn’t actually need to stop as often as we’d expected. We only stopped at a fast food restaurant once over 3000 kms and nearly two weeks. The rest of the time, we kept an eye out for farm markets, playgrounds, beaches and riverside parks (or, pictured above, a riverside farm market with playground and tractor to climb on. Thank you, rural New Brunswick). Getting a bit of space, and giving Jasper opportunities to really move his body kept everyone happy. Staying on the road. The only way to cover a lot of miles is to just keep going. Although we stopped without a second thought when we needed to, we also tried to keep on moving when we could. We tried to keep an eye on the gas tank and the gas prices (the GasBuddy app was handy) during stops, so that we wouldn’t have to stop again unneccesarily. Keeping snacks on hand, within reach, could help to hold off lunch a little longer if we were making good time or wanted to make it to a particular destination. Be here now. I’d packed an assortment of activities for Jasper — some were left overs from flights we’ve taken, like an etch-a-sketch book, a button snake, and some felt work; a homemade colouring binder; his sticker collection and book. Unfortunately, it seemed obvious pretty early on that Jasper gets some motion sickness, feeling nauseous when he spent time looking at his work instead of out the window. So, most of the trip, he looked out the window. Rather than the sort of educational entertainment I’d planned on, he was engaging with the real world — which was also the real reason we were on the trip. It meant he often needed more of my attention, but playing “I Spy” is as good a way to get through the hill and highways of New Brunswick as any. Looking out the window lead to conversations about naming construction and farm machinery, coming to recognize provincial flags, and speculating about the weather. Listen up. The car stereo is everybody’s friend. It distracts from the squeak of the windshield wipers, it closes out conversation for a few minutes, it passes the time. We stocked up on audio books from the library and David grabbed a few favourite cds on the way out the door, and we were ready to roll. We took turns choosing what to listen to, and Jasper was usually willing to wait out a grown-up choice before getting back to “Macaroni and Cheese!” (aka Andrew Queen‘s great food-themed children’s album, Grow). Quick audio book review: Olivia and Frog and Toad were both pleasant listens, The Moffats is a family favourite, while Paddington Bear didn’t make it past the first few minutes. As we settle in, do the laundry and return to life at home, I’m thrilled to know that our time on the road was successful not only in getting us to our destination, but in bringing our family together to meet a challenge, and creating truly lasting memories all along the way. What are you up to this summer? What will your memories of summer ’15 be? If you have any road trip tips in your back pocket, let me know! Wow, how exciting. I’ll send an email. Thanks for reading along!